With Memorial Day fast approaching, it’s a good time to begin thinking about ways to save energy and water this summer in order to produce real, measurable benefits for you and the planet—as well as help take stress off the power grid and prevent blackouts. Meanwhile, forecasts from the National Weather Service suggest that large portions of the United States can expect a warmer-than-usual summer this year. Extreme temperatures are a hallmark of climate change, a shift that also contributes to increased power of hurricanes and summer storms. The biggest source of global-warming pollution comes from power plants, so anything you do to cut your electricity demand can ease the overall problem. Fortunately, there are plenty of relatively easy fixes that can make solid gains in home energy efficiency—and costs. For example: The average homeowner spends about $240 a year just on air conditioning, but you can that electric bill and still keep your cool. It may be time to get a new AC. Sure, it’s an expense, but you can save money in the long run by purchasing a central cooling system or room unit with the ENERGY STAR™ label. They use about 15 percent less energy than conventional models. For a room air conditioner (window unit or one inserted into the wall), the savings can total an average of $90 over the unit’s lifetime. If your central AC unit is more than 12 years old, replacing it with an ENERGY STAR-qualified model could cut your annual cooling costs by 30 percent. In addition, be sure to clean or replace your filter about once a month as a dirty filter makes your air conditioner work harder. Switch to a programmable thermostat. This nifty tool can do all the work to control your home climate. It makes sure your AC cools when you need it and dials back when you aren’t home, like when you’re at work. If you don’t have one, make the investment as they can cut energy costs by 20 percent to 30 percent. Programmable thermostats range in price from $25 to $250, and the more expensive ones include the ability to remotely adjust the settings via your smart phone. Consider setting the thermostat to 72 degrees when you’re home, 80 when you’re away. Fans help. Use a ceiling or portable fan instead of air conditioning if it’s not too hot. When it is, you won’t need as much AC if you also run your ceiling fan so it pushes air down to provide an additional cooling effect. Fans cost a lot less to operate, too. But when you leave the room, be sure to turn them off. If your house has an attic, install an attic fan to help pull hot air from the house. When the temperature outside is bearable, generate a draft inside by cracking lower-story windows an inch or two to pull in cooler air. 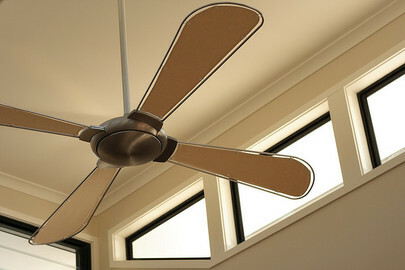 Set up portable fans near upstairs windows to push out warm air that rises from convection. Think about your windows. To keep cool air in, seal and insulate around windows. When it's hot outside, pull down the blinds/close the curtains on the windows on your home’s south, east and west sides. In the market for new windows? Energy Star-rated versions must meet requirements tailored for America’s four climate regions. 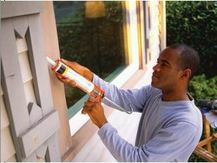 Learn more about your windows and other ways to save energy at home. Mind the water heater. To prevent getting scalded and save some money on your utility bill, dial back the setting on your water heater to 120 degrees. Some manufacturers ship water heaters with the setting at 140 degrees but that’s higher than most of us need. And when you take your summer vacation, turn the temperature way down. Keeping food cold and saving energy. If your refrigerator is at least 10 years old, replacing it with a new, more energy efficient model can cut your energy bills by $150–$1,100 over its lifetime (Use the ENERGY STAR Savings Calculator to find out exactly how much). Set the fridge temperature at 38 to 42 degrees Fahrenheit; your freezer at between 0 and 5 degrees Fahrenheit. More ways to save electricity. Unplug seldom-used appliances, like an extra refrigerator in the basement or garage that contains just a few items. You may save around $10 every month on your utility bill. Additional suggestions are here. Water wisely. Water your lawn or garden in the morning or evening, when evaporation is lowest. For your garden, consider installing drip irrigation connected to a timer. You’ll use a lot less water and it will go only where it’s needed. Water isn’t free. Every gallon saved means money saved on water bills. Shower with a bucket in the stall to capture a gallon or more of excess water to use for clothes or plants. Taking a shorter shower can save up to 5 gallons. That pool cover isn’t just for the winter. If you have a backyard pool, put on the cover when it’s not being used. Pool water evaporates, and if the pool is heated, that’s an energy drain as well. Use a commercial car wash. Washing a car yourself can use 100 gallons of water, and the run-off goes untreated into the storm drain and often directly into nearby bodies of water. But commercial car washes typically use less than 40 gallons of fresh water per wash and the discharge goes to the local treatment plant. Inflate those tires properly. Inflating your tires to the proper amount can improve car mileage by up to 3 percent and cut your gas bill by about $60 a year. So before you take that road trip, check your tire pressure.